The following charts are the third in a series on the US federal personal income tax system by Mercatus Center senior research fellow Veronique de Rugy. The first chart uses historical IRS data to compare the share of federal income taxes paid by Americans in the top 10 percent to the bottom 90 percent since 1986. It is apparent that the top 10 percent of income earners have historically paid more than half of the entire federal income tax burden. 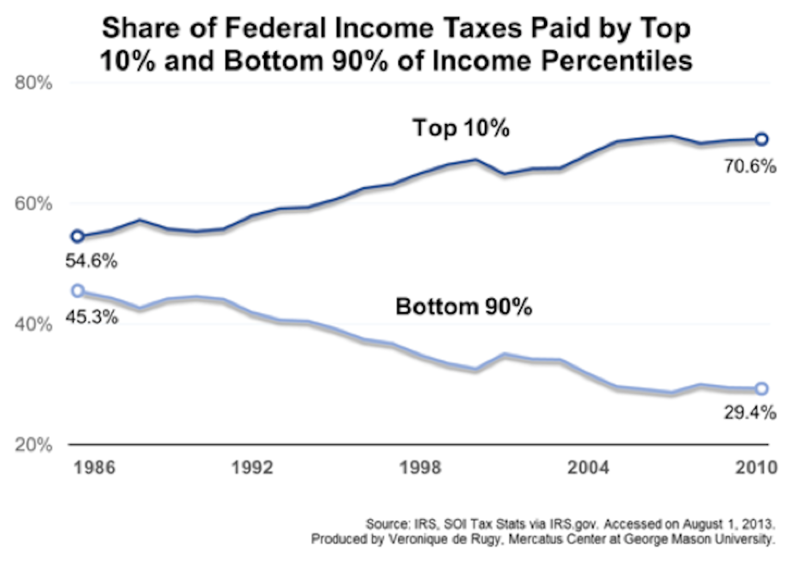 Alarmingly, the share of the top 10 percent has been rising consistently, climbing to about 70 percent by 2010, while the share of the bottom 90 percent has fallen to about 30 percent. The second chart uses data from the Congressional Budget Office to illustrate the change in federal income tax rates that would be required to pay for federal entitlement spending. Staying on the current course will cause entitlement spending to surge. Increased spending, not insufficient revenue, will widen the gap—which represents debt—between government spending and revenue. The data make it clear that marginal rates will have to be raised to unprecedented levels to close the gap. 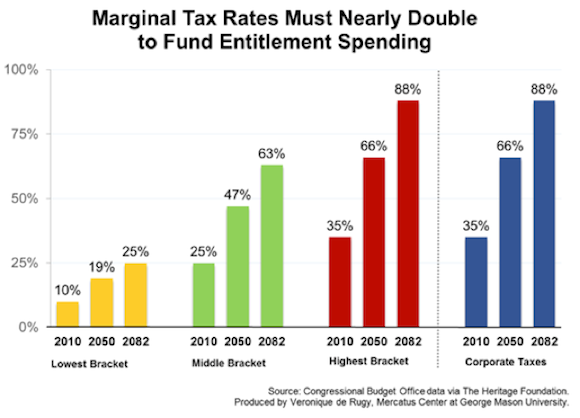 Taxes will have to more than double for even the lowest tax bracket in order to pay for current Medicare, Medicaid, and Social Security spending.